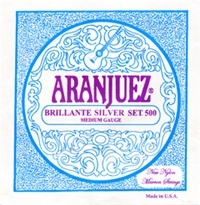 The new nylon bass strings of the Aranjuez Brillante series are now even more durable, thanks mainly to their brass winding wire. Brass oxidizes much slower than silver and therefore retains its original tone much longer. And just in case you still had doubts: brass has been used for ages to build bells, cymbals and countless other percussion instruments known for their excellent sound and vibration characteristics. The new Marron treble strings are now even brighter and more powerful than ever before. Very nice strings and great price. My guitar is a spruce top, open harmonic bar and rosewood sides/back with an open clear sound. These strings allow the wood qualities to shine. I normally use Knobloch carbons (warm sounding) and Optima silver plated nylon. Must say I wasn't impressed at first stringing, but once these quickly came to a stable pitch they sing brilliantly. I've never had any short strings or difficulty, no breakage or defects. Never used the flexible tie end. Trebles are quick to respond, mild stiffness but slurs and quick articulated runs are crisp and effortless. No tubby g string and easy vibrato and dynamic range. Basses are bell like with rich character. Seamless transition from string to string. Intonation up the fretboard is outstanding and comfortable. Longer than average life. I'd highly recommend these for those with an already bright open sounding guitar. Sorry, dissapointed. Cheap strings and not more than normal about everything. My guitar deserves better. I have never had a more difficult set of strings to install. Some of the strings were almost too short. The treble strings seemed unusually sfiff. And to top it off the D string broke as I was tuning it. Not impressed at all.